Volunteer with us in October 2019! If you are a Dental, Medical, Community, or Student Volunteer, please make sure you sign up to receive confirmation emails from us. Click the SUBSCRIBE button above! 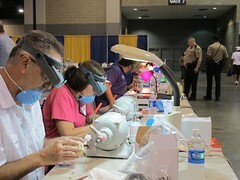 Watch this YouTube "Amateur Video" taken live from the clinic from the perspective of a NC Dental Laboratory Association volunteer to gain a sense of the size and scope of NCMOM-Charlotte.